We are releasing an image of a collectible coin set and carrying out enquiries following an aggravated burglary on Milton Road in Waterlooville. At 5:10pm on Tuesday 26 February a 28 year-old man, who uses a wheelchair, was returning home. When he unlocked his door two men pushed the victim inside and threatened him with a knife, He was not hurt. The men stole an Olympics colour coin collection, a Beatrix Potter coin collection, and a rose gold wedding ring, before leaving. Aged in his early thirties. He had dark brown hair and dirty teeth. He was wearing a black zip-up hooded jumper and black tracksuit bottoms. He spoke with a local accent. He was wearing a dark blue or white jumper and blue jeans. 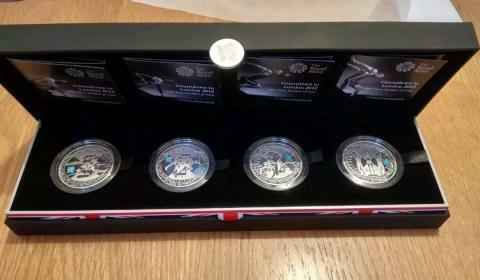 Investigating officer DC Amanda Layton said: “The items taken during this aggravated burglary are very distinctive, please look at the photograph we’ve issued, has anyone offered you these coins? “The Neighbourhood Policing Team is carrying out regular patrols in the area and residents with any concerns can speak to one of these uniformed officers, who are also delivering crime prevention leaflets. “We’ve reviewed other crime reports in the area and we haven’t had anything similar, or which could be linked, reported to us at the current time”. Anyone who recognises the coins, saw what happened, or the men in the area beforehand can call 101 quoting 44190069766.